What is The Pilates® Method? The Pilates Method, developed by the legendary physical trainer Joseph Pilates, is a full body exercise system. Emphasizing body alignment, correct breathing and concentration, Pilates uses the abdomen, lower back and buttocks as a power center, enabling the rest of the body to move freely. A series of controlled exercises and specialized equipment create variable resistance for muscular exertion. 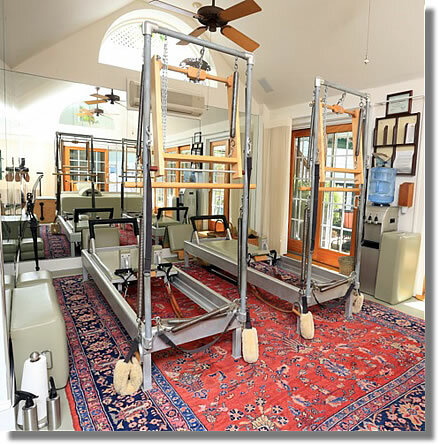 The primary apparatus used in Pilates is the Reformer, a bed-like platform with a carriage that slides along tracks. The carriage may be moved by pushing against a bar or pulling leather straps with the arms or legs. Exercises are performed from a reclining, sitting, kneeling, standing, or piking position. Other areas of the body are strengthened on the Cadillac, Barrel, Chair, Tower and Mat. Imagine an exercise program that rewards you with the suppleness of a trained dancer, restoring muscular balance while improving your posture. Imagine an exercise program that helps heal muscular and soft tissue pain, while it builds the strength to prevent further injury from occurring. Imagine an exercise program that uses your entire body, not just isolated muscle groups. Imagine a program that you look forward to, that engages you, leaving you refreshed and alert with a feeling of physical and mental wellbeing. The Pilates Method of Physical and Mental Conditioning will do all of this, and more. Pilates is a proven and acclaimed conditioning program that has helped people strengthen and empower their bodies since the 1920's. Click here for a map to our location. Everyday activities such as sitting, standing, running, playing sports, dancing, or working out, strengthen some muscle groups, but may leave others weaker and underdeveloped. The resulting muscular imbalance may never be noticed as such, but it can eventually become a source of fatigue, discomfort, pain and even immobility. The Pilates Method of Body Conditioning facilitates muscular harmony and balance. People who consistently use Pilates find that without conscious effort they improve posture, move more gracefully, slepp better, and develop firmer, sleeker and more powerful muscles. Joseph Pilates spent more than 50 years refining an exercise system that uses memory and musculature to create mental and physical harmony. 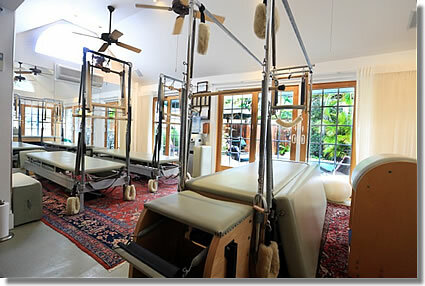 His goals continue to be achieved as each Pilates student demonstrates the full measure of his or her capabilities.